When I was in secondary school, I decided to participate in its beauty pageant. As you may know, the formal wear is a key segment, and so in my gusto and excitement, I spent weeks looking through magazines and websites, and in my head, I put together what I thought to be the most perfect dress. Imagine my excitement when I learned that one of Barbados’ top fashion designers at that time had agreed to sponsor me. I met up with him and gave him all of my specific requirements for the dress – down to amateur sketches. He listened, nodded, and even took my sketches, and a week before the pageant, finally called me to try on the dress. I could see that he followed my instructions to the T.
Last year, March 2nd 2013, I wrote a satirical post on how to handle a rejection email. It was meant to be all fun and games, but recently I’ve seen some situations where fellow writers have been faced with some type of literary rejection, and have reacted strongly – some of them actually deciding that their writing is crap and they should give up. Statements, that in the moment, really don’t f**king matter and fall on deaf ears. Earlier this month I announced that I was going to publish a collection of short stories called “In Time of Need” and I received a lot of private messages asking me if I had found a publisher for my stories. I had decided not to even approach a traditional publisher for this collection, and I must admit it was a decision that caused a lot of cognitive dissonance for me. You see, although you read countless stories of successful self-published authors (and I know some personally), I still had that subconscious nagging idea that to be a “real author” you needed to be validated by an authentic publishing house. In fact, it was this nagging ideology that postponed the publishing date of this collection because I have had these stories wasting away on my computer for a very long time. Every now and again I would submit them to competitions and journals, and every now and again they may win a prize or be accepted for publication. THE CROPPER FOUNDATION’s 8th Residential Creative Writers Workshop is now open for applications. The Workshop sponsored by The Cropper Foundation, and organised in partnership with the Department of Creative and Festival Arts, University of the West Indies, St Augustine, will take place from June 29th to July 13th 2014 in Trinidad and Tobago. Applications are open to published or unpublished prose fiction writers, as well as poets and playwrights. Two experienced and published authors — Professor Funso Aiyejina and Dr Merle Hodge from the University of the West Indies will be the residential moderators for the two-week workshop. Since 2000 they have mentored writers from Antigua, Bahamas, Barbados, Belize, British Virgin Islands, Commonwealth of Dominica, St. Lucia, Guyana, Jamaica, Montserrat, Puerto Rico, Trinidad and Tobago, and the Caribbean Diaspora (Canada, USA, France), many of whom have gone on to publish their original creative writing and won a number of international Literary Awards. The writers’ workshop is part of The Cropper Foundation’s effort to contribute to the development of the Caribbean on many levels and in different areas of interest. Participants of the Residential Creative Writers Workshop will also benefit from visits and discussions with published authors and professionals from the publishing industry. danielle.lyndersay@sta.uwi.edu; or sherry-ann.carrington @sta.uwi.edu — Subject: Writers’ workshop or visit The Cropper Foundation’s website at http://www.cropperfoundation.org or download the application form HERE. On Sunday, September 15th, I was 4 pages away from completing my second feature-length screenplay; a psychological thriller called Two Smart. It was hard work, and many times I chastised myself for making things more difficult than they had to be. You see, I wondered if I could write 90 pages of a screenplay, set in one location, with just three characters. I don’t want to give away anything just yet, but when I say one location, I mean ONE location. I challenged myself even further; for example, not simply a house – but one room in a house. So I set about my task to make a story interesting enough, balancing the right about of dialogue and action to maintain an audience’s attention for an hour and a half. That Sunday I knew I was going to finish the script. I mean, I KNEW exactly how the movie was supposed to end. I had a scene by scene outline! I woke up at 6am as usual, smiling and messaging close friends that I was about to finish the script. I went on Facebook, read some funny statuses, went on gchat and before I knew it, it was 9am. I still had the whole day to write those final four pages, right? I spent the entire day running errands, responding to emails, watching videos online…until I realised that the sun had disappeared, and the CBC Evening News had just finished. Ok Shakirah, time to write these four pages, and I opened the Final Draft Document. On Dialect – How Caribbean people supposed tuh talk in a story, eh? 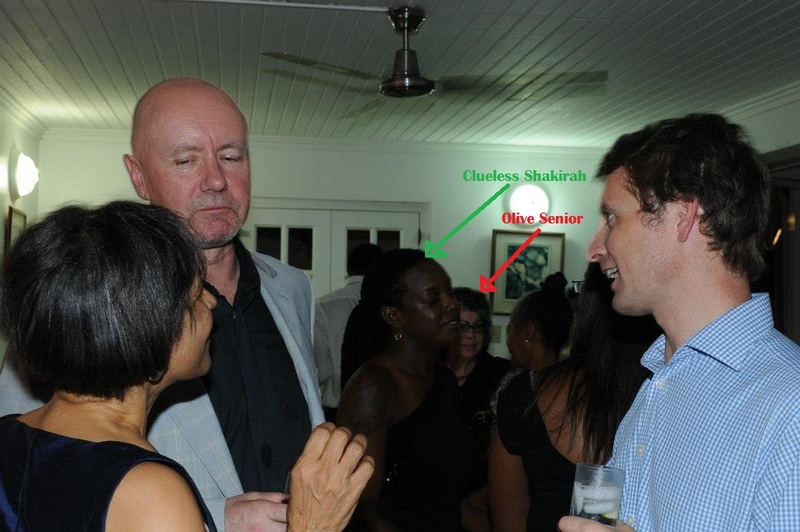 In a previous post about how I met Olive Senior, I mentioned that I wanted to do a separate blog post on the Bocas Lit Fest session with Irvine Welsh, author of the very famous Scottish novel, Trainspotting. Anyone who knows me knows I have a very soft spot for anything Scottish, as I consider it my second home. The Scots are very similar to us here in the Caribbean; they are friendly, love to laugh and love to drink – can’t get any better than that. Irvine Welsh was refreshing. He reeked of confidence. He sat on the stage chewing the life out of a piece of gum, not caring about the hundred or so eyes staring at him. He gave honest answers to every question; even the rather rude one from a nosy audience member who asked about the contents of his personal bag. I mean, come on! (All sane Caribbean people covered their face in shame when Welsh actually answered “a shirt and a pair of sneakers”). He should also give lessons in how to read fiction to an audience. It was one of the best readings I have witnessed. He captivated us with every word and antic, he did not apologise for any of the cuss words which occurred every sentence or so, and his language…was brilliantly Scottish. Did he get a standing ovation? I can’t remember. But we in the audience were glad that he read another piece, despite it being a questionable excerpt requested by interviewer, B.C. Pires, on the slaying of a dog. And I thought my humour was dark!